The Cumberland Mine in Greene County, Pa.
A Greene County coal mine is asking the Pennsylvania Department of Environmental Protection to allow it to raise its seasonal pollution limits for mine wastewater to allow it to discharge more pollution during the driest months of the year. 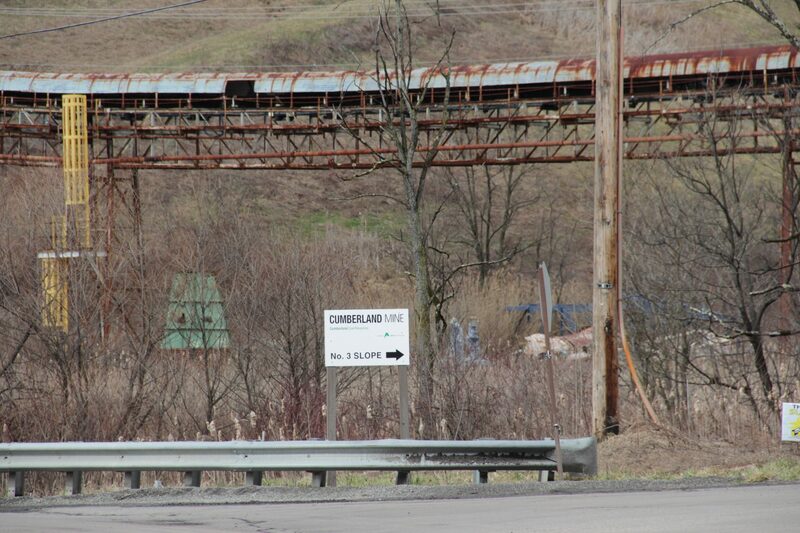 The Cumberland Mine in Whitely Township wants the DEP to raise its limits for two types of pollutants from June to November. The mine currently doesn’t discharge mining wastewater during those parts of the year. Instead, it stores that wastewater on-site before discharging it during the wetter winter and spring months, when the Monongahela River can absorb more pollution. Now Contura, the company that owns the mine, wants those seasonal limits lifted. It says that since the Monongahela is getting cleaner than it once was, and no longer violates federal standards for certain pollutants, that the regulations can be eased. “This is not an increase in the [amount of pollutants] being discharged it is just being averaged throughout the entire year,” the company wrote in its draft DEP permit. Contura’s permit does not state why the revision would benefit the company, and did not immediately respond to requests for an interview. The company said in the draft permit that its facility produces less wastewater than it did the last time it got a discharge permit, in 2013. The mine’s request means it would account for around 80 percent of the river’s allowable pollution for two types of contaminants — sulfates and total dissolved solids. Sulfates have been shown to impair aquatic wildlife, and high levels of TDS can lead to high levels of carcinogenic compounds in drinking water. The Monongahela is the source of drinking water for more than 200,000 people, according to the Center for Coalfield Justice, which, along with the Sierra Club, opposes the draft permit. “Taking up that much capacity in the Monongahela River–you’re not leaving a lot of room for unpredicted pollution events,” said Veronica Coptis, executive director for the Center for Coalfield Justice. Paul Ziemkiewicz, Director of the Water Research Institute at West Virginia University, says allowing that level of pollution could be cutting it too close to the limit to keep the river below federal standards, especially during the dry season. “That to me seems a narrow margin of safety,” he said. Ziemkiewicz, who’s been monitoring the river’s pollution levels with the Three Rivers Quest project, says it should really have only 50 percent of its maximum pollution level at any given time. That way there’s a buffer for water quality in case of the release of minewater from an abandoned mine, or a dry spell, which increases the concentration of pollutants in the river. He said the time of the year to worry about water quality on the Monongahela is the dry months. “You never get too close to your limits except in late summer or early fall” under the current regime of regulations, he said. The DEP did not immediately respond to questions. The public comment period on the mine’s permit request ends August 19.